Dermabond Protape (2-octyl-cyanoacrylate and pressure sensitive adhesive mesh; Prineo, Closure Medical Corporation) is a topical mesh and skin adhesive that forms a strong polymeric bond across opposed wound edges allowing the normal healing process to occur. No published studies have already compared the use of a topical mesh en skin adhesive in wound closure. 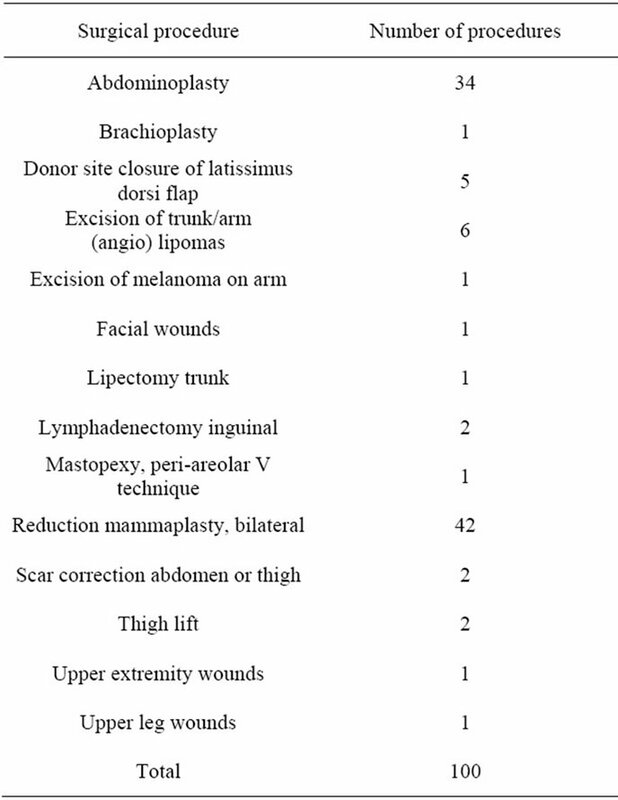 This study evaluated the possible applications of a combined mesh-adhesive system in 100 plastic surgery operations (14 different surgical procedures) with a mean follow-up of 85.5 days. The rate of allergic reaction, infection, wound dehiscence and hypertrophic scar formation were recorded in relation to patient co-morbidities, medication and tobacco consumption. No technical restrictions were found during the Dermabond Protape application. The average time for the topical mesh and skin adhesive application was 2 minutes. The Dermabond protape was removed 7 through 10 days after the operation. Three patients (3/100 or 3%) reported an allergic reaction without increased scar formation. Hyper-inflammation in one or more wound areas with a micro-abscess were noted in 11 different patients probably due to polyglactin 910 (vicryl) sutures at their scheduled follow-up visit 1 week after their operation. Increased tissue inflammation and scar formation were found in these patients with hypertrophic scars in 1 patient (1/11 or 9.1%). One upper leg wound dehiscence was seen in a diabetes mellitus patient using corticosteroids. Two patients (2/100 or 2%) with a history of tobacco abuse showed a partial wound dehiscence after an abdominoplasty and a partial areola dehiscence after mamma reduction respectively (Table 2). Dermabond Protape (2-octyl-cyanoacrylate and pressure sensitive adhesive mesh; Prineo, Closure Medical Corporation) is a topical mesh and skin adhesive that forms a strong polymeric bond across opposed wound edges allowing the normal healing process to occur. Benefit from tissue glue (2-octyl-cyanoacrylate) only has been especially observed with use in laceration repair, plastic surgery, and oral and maxillofacial surgery [1-3]. However, no published studies have already compared the use of a topical mesh en skin adhesive in wound closure according to Pubmed (service of the U.S. National Library of Medicine and the National Institutes of Health at http://www.ncbi.nlm.nih.gov/pubmed) . Therefore, this study evaluated the possible applications of a combined mesh-adhesive system in plastic surgery procedures. (mean age 44.3 years) were operated for a total of 14 different surgical procedures (Table 1) from January 2010 through November 2010 with the abdominoplasty (n = 34) and the reduction mammaplasty (n = 42) as most frequently performed operations. Surgery and follow-up of the 100 procedures were performed by one surgeon. During each procedure, Scarpa fascia and deep dermal approximation were performed by polyglactin 910 sutures (Vicryl; Ethicon, Inc., a Johnson & Johnson Company, Somerville, N. J.). The wound edges were further approximated by the adhesive mesh (Figure 1(a)). 2- Octyl-cyanoacrylate skin adhesive was applied on the mesh and a 3 minute dry period was necessary to achieve a strong polymeric bond (Figure 1(b)). Full strength was reached after 3 minutes, when the adhesive had also formed a protective barrier over the incision . Post-operative gauze dressings were only used during breast surgery as a safety measure to prevent friction and were laid on the Dermabond Protape in the bra after the 3 minute dry period to prevent adherence to the mesh. Patients were allowed to take a shower. Table 1. Overview of surgical procedures with Dermabond Protape wound closure. The Dermabond Protape was removed during the first follow-up visit 1 week after the operation (Figure 1(c)). The rate of allergic reaction, infection, wound dehiscence and hypertrophic scar formation were recorded in relationship to patient co-morbidities, medication and tobacco consumption. No technical restrictions were found during the Dermabond Protape application during the 100 surgical procedures. The average time for the topical mesh and skin adhesive application was 2 minutes. The mean follow-up time was 85.5 days (range 6 - 422 days). Three patients (3/100 or 3%) reported an allergic reaction after a reduction mammaplasty and excision of trunk angiolipomas with erythema, bullae and itching 2 through 5 days after the Dermabond Protape application (Figure 2). 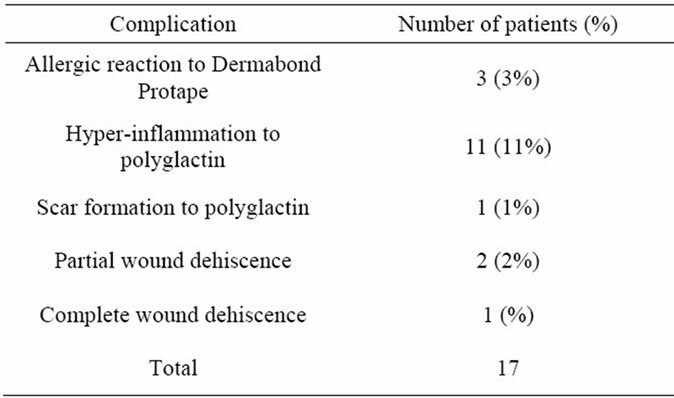 In 2 patients, contact dermatitis originated only beyond the wound areas with only skin-tissue glue contact. Increased tissue inflammation but no increased scar formation were found in these patients. No history of allergies or systemic diseases were found among these patients. Figure 1. (a) Dermabond Protape mesh application during an abdominoplasty procedure; (b) Skin adhesive (2-octylcyanoacrylate) application on the mesh; (c) Dermabond Protape removed 1 week after the operation (vertical scar) and still in situ at the horizontal scar. or 11%) probably due to polyglactin 910 (vicryl) sutures at their scheduled follow-up visit 1 week after their operation. Increased tissue inflammation and scar formation were found in these patients with hypertrophic scars in 1 patient (1/100 or 1%). No increased or hypertrophic scar formation was noted in the remaining patient group. One upper leg wound dehiscence was seen in a diabetes mellitus patient using corticosteroids. Two patients (2/100 or 2%) with a history of tobacco abuse showed a partial wound dehiscence after an abdominoplasty and a partial areola dehiscence after mamma reduction respectively (Table 2). Figure 2. Allergic skin reaction after Dermabond Protape application on the trunk. Table 2. Overview of complication rates with Dermabond Protape. Our analysis provides an insight into the diversity of Dermabond Protape application in surgical procedures. Nevertheless, some potential methodological limitations of our study need to be considered. First, we limited our survey to plastic surgery procedures. However, wound closure in many different areas of the human body was performed using the Dermabond Protape. 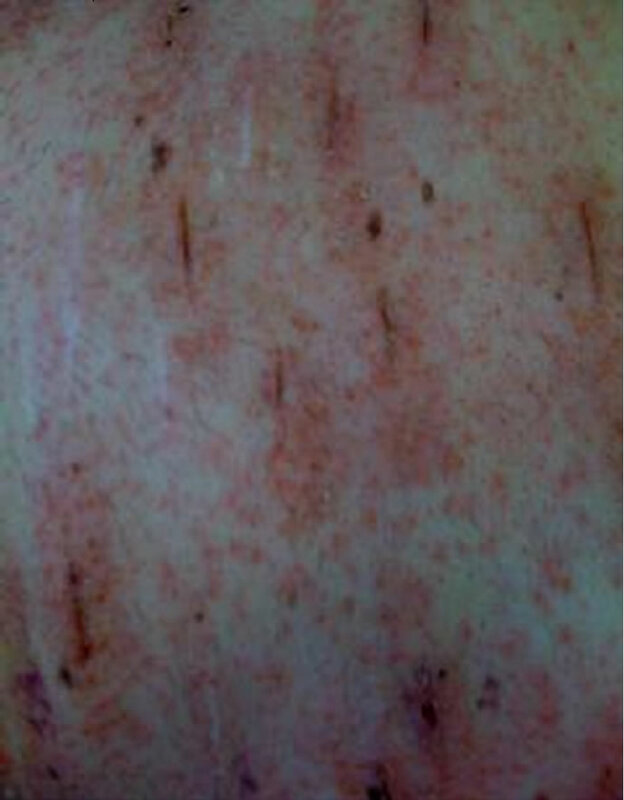 Second, no wound evaluation scale was used to evaluate scar characteristics. Third, no comparison between Dermabond Protape and other suture techniques was used. However, it was beyond the scope of our study to assess such a potential difference as the diversity in meshadhesive application and wound complications was our main priority. Furthermore, we did not assess the possible economic impact and cost-effectiveness of use of mesh-skin adhesives. In our study, one Dermabond Protape costs EUR73. Furthermore, extra subcutaneous sutures may be necessary during Dermabond Protape closure. However, even in the hand of experienced surgeons the overall time required for the application of skin adhesive is less than for skin suturing [6,7]. According to the literature, only one allergic reaction to Dermabond Protape was reported compared to our 3 cases mentioned. Although the exact cause of the allergy (mesh or skin adhesive) is unclear, we suppose this may be caused by the 2-octyl-cyanoacrylate skin adhesive based on the 2 case reports with a 2-octyl-cyanoacrylate contact dermatitis reported in the literature [7-9]. A strong, flexible bond between the wound edges may be formed within 45 to 60 seconds by use of a 2-octyl-cyanoacrylate skin adhesive only. This time window allows manipulation of the wound edges for approximately 30 seconds after application of the skin adhesive, which enables the surgeon to achieve optimal tissue approximation . In our series, tissue approximation was possible with the skin mesh only without the need for tissue manipulation while the 2-octyl-cyanoacrylate adhesive acted as an adjuvant in wound closure. In our hands, we have the impression to achieve stronger wound sutures using the topical mesh and skin adhesive compared to tissue glue only. At present, no published clinical studies comparing these types of wound closure are available . Based on our results, we suggest that the use Dermabond Protape should be considered as a sound alternative for skin suturing. Still, the patients should be notified about the crusty appearance of the scar that might follow such use. Nevertheless, randomized controlled trials are necessary to evaluate the scar characteristics of suture closure versus Dermabond Protape application to further justify the use of Dermabond Protape. Dermabond Protape is a quick and strong wound closure system applicable to various plastic surgery procedures. 1) This work has been executed as part of our regular appointment at the Sint-Jan Hospital Bruges, and that there have been no external or commercial sources or funds supporting this work. 2) No financial support or benefits have been received by any of the authors, by any member of our immediate family or any individual or entity with whom or with which we have a significant relationship from any commercial source which is related directly or indirectly to the scientific work which is reported on in the article. E. F. Switzer, R. C. Dinsmore and J.H. North Jr., “Subcuticular Closure versus Dermabond: A Prospective Randomized Trial,” American Journal of Surgery, Vol. 69, No. 5, 2003, pp. 434-436. K. M. Dunst, J. Auboeck, B. Zahel, B. Raffier, et al., “Extensive Allergic Reaction to a New Wound Closure Device (Prineo),” Allergy, 11 November 2009. (EPUB ahead of Print).